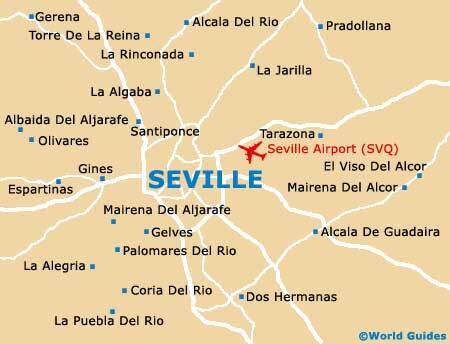 A city boasting a lengthy historical pedigree, Seville comes with some fine Spanish buildings and grand landmarks, a number of which were created or renovated for the Ibero-American Exposition, held from May 1929 until June 1930. The city's large Monasterio de Santa Maria de las Cuevas is amongst the oldest and most impressive, and was founded way back in 1400, being built by the Carthusians. Also very noteworthy is the 16th-century Seville City Hall, which presides over the Plaza Nueva and is rather palatial in its appearance, being topped with ornate balustrading. Sightseers may like to check out the Palace of the Countess of Lebrija, which ranks amongst the finest residences in the city and successfully combines a mixture of architectural styles. During his life, famous navigator and explorer Christopher Columbus stayed and worked at the Monasterio de Santa Maria de las Cuevas, and was at one stage even buried here. Carthusian monks lived in this monastery complex until 1836 and shortly after they left, the site was converted into a large ceramics factory. After many years of successful production, the factory finally closed in 1980 and the monastery was then completely restored in time for Seville's 1992 Exposition. Highlights include the Capilla de Afuera by the main gate, the Casa Prioral - which features an exhibition about the restoration project, a Mudejar cloister with frequent exhibitions of art, and a nearby chapter house with many splendid marble tombs. 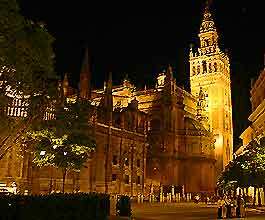 The monastery can be reached by bus and is located in the Isla de la Cartuja area. Guided tours are available. The Ayuntamiento is Seville's City Hall and this beautiful landmark building stands between the historic Plaza de San Francisco and the large expanse of the Plaza Nueva, next to the Consorcio de Turismo (Tourist Office). Built between 1527 and 1534, the Ayuntamiento was originally used for public trials in the city and features some detailed and ornate architecture. Visitors will find many works of art, sculpted ceilings, several large rooms with some splendid decorations and an impressive, stylish staircase. This grand and imposing palace dates back to the 15th century and is full of many wonderful features. Situated in the busy historic centre of Seville and close to the Teatro Quintero, highlights include ancient tiled Roman-style mosaics, large statues, many interesting antiques and a sizeable central courtyard. The Palacio de la Condesa de Lebrija was opened to members of the general public in 1999 and now operates as a museum-type attraction. Of note, the building is easy to reach by either foot or bus.